wearing over the knee boots. Being under 5'0 feet this trend can be hard. doesn't fit right out of the box! its hard to want to shell out the cash. they really do make all the difference. Boots that even the shortest of girls can wear! P.S. It never hurts to wear a mini skirt. Loving the skirt so much! Love the colorful skirt and your kissy face. I love the way you write prose. Such a great look on you, girlfriend! Such a great look! 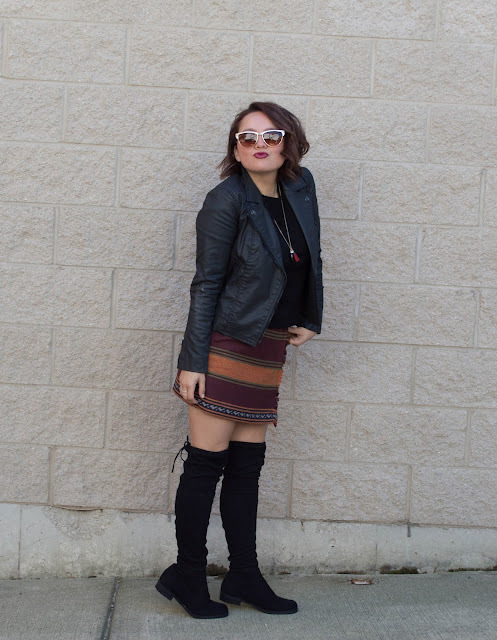 I love the mini paired with those boots...such a great combo! Thanks Shannon! Love me a mini! Anna I almost got that one too but then this one spoke to me more! That jacket & boots <3 Love your ensembles. Thank you and worth it too! i adore your skirt!!! AWESOME PRINT! I strongly believe in investing in quality or unique pieces! The boots look great only you and are such a good staple to have! Best advice I have ever received! Thanks Bree for stopping by! Ahhh I have some tips please share if you have any!! awesome outfit, so stylish and edgy! You are rocking those boots! I don't think I'd ever be able to pull them off. Yes you totally can!! If I can you can :) go out and rock them girl! 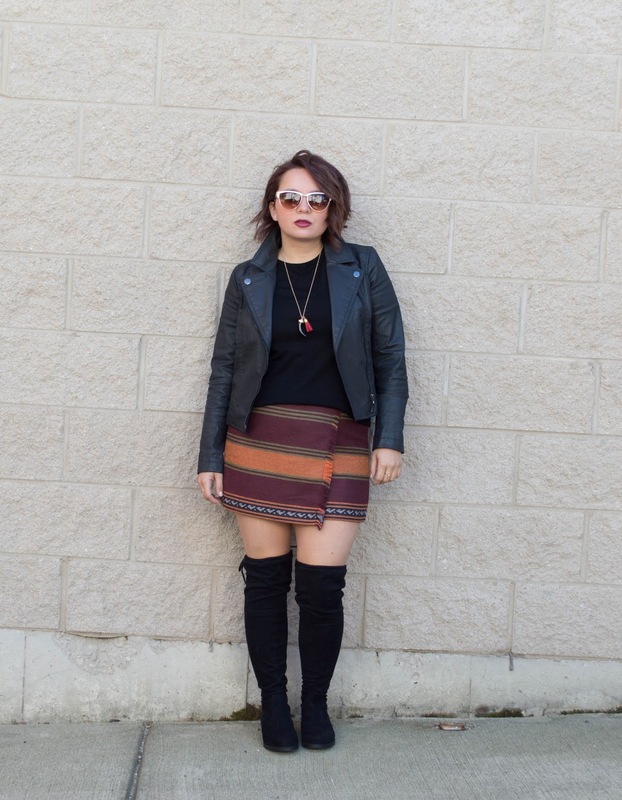 love the skirt and the boots! great look! Love these sunglasses and your hair is so so chic! Thanks I love a good pair of sungies! You're killing this! 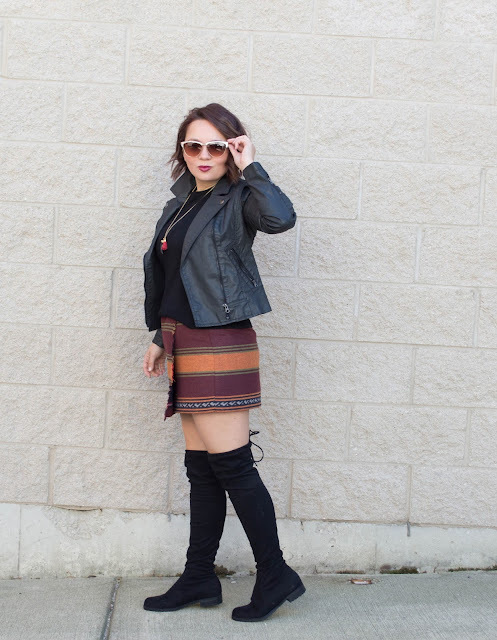 Love the skirt + boot combo. So much sass- work it, lady! Thanks lady!! All of the sass! Mia thanks so much for your kind words! Such an amazing, chic look! Love your skirt!! Amazing look!! Who doesn't love a great pair of OTK boots? Yours are so cute and stylish, pairing them with that mini skirt was a great idea!